We are just halfway through the year and Nokia already has a few terminals already launched, starting at the Mobile World Congress . The latest, which arrived just a few weeks ago, were an update of its low-end and mid-range : the Nokia 2.1, Nokia 3.1 and Nokia 5.1 , an evolution in components compared to their previous devices. It seems that the news of HMD Global , the manufacturers of Nokia, will not cease and still have several surprises up their sleeve. For example, a new terminal from which CAD plans have already been filtered from the factory and with which those responsible for tigermobiles and @OnLeaks have recreated and published the aspect that the phone will supposedly have when it reaches the market. We are facing a phone that surprises and its aesthetics and is that with the Nokia 5.1 Plus the Finns return to propose a notch (as with its first model with eyebrow, the Nokia X6 ) that is accompanied by a chin quite remarkable in the part lower. It is true that this feature makes the device significantly increase its use of the surface dedicated to the screen with respect to the Nokia 5.1, although the notch is not to everyone’s liking. With a rather elongated body and an elegant design , the Nokia 5.1 Plus has a dual rear camera in vertical arrangement and accompanied by an LED flash, all embedded in a tablet that protrudes 0.8 mm from the flat body of the phone. Also, just below, a fingerprint reader . We have also confirmed a USB-C input and a 3.5 mm jack connection . 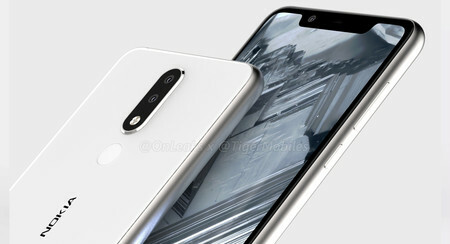 In dimensions, the CAD drawings specify a 5.7-inch diagonal screen , a size halfway between the Nokia 5.1 and Nokia X6, and the numbers are completed with 149.5×71.9×8 mm, 8.8 mm if we have the relief of the rear camera of this new Nokia 5.1 Plus and a little lower than the previous 5.1, but with more screen. At the moment, these are all the data available in the filtration, although we assume that we will not soon hear the first technical specifications, and the rumors are already starting: we are talking about a MediaTek Helio P23 processor .